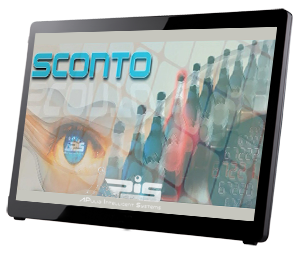 SCONTO is a counter for multi lanes conveyors in packaging plants. In these contexts, the stations responsible for specific tasks (inspection of the containers, filling, sealing, labeling, cartoning etc.,) are connected by conveyors, which not only acting as a link and transport from one station to another, but perform (as a buffer) the function of “supplier” / “emptier” at the entrance / exit of each station, when the operation of two consecutive stations loses synchronism. In fact, the individual stations are characterized by capacities and throughput which often differ significantly for the different nature of the intrinsic operations at the same station. The control system of a packaging line aims to conveniently set the speeds of the various stations, according to the availability/crowding of the pieces (bottles or containers in general) on the various conveyor belts, tending to a “50%-filling” of the individual “buffers”, and to an operation as close as possible to the maximum throughput for the slowest station. Now, albeit photocells or mechanical sensors easily count pieces when they flow in a single lane, such devices are ineffective in the sections where the pieces pass on more (sometimes irregular) lanes. And, for the particular case of the beer, the optimum control of the flow of the filler, resulting in the gradual as possible of the liquid flows, with direct impact on the quality of the bottled product.